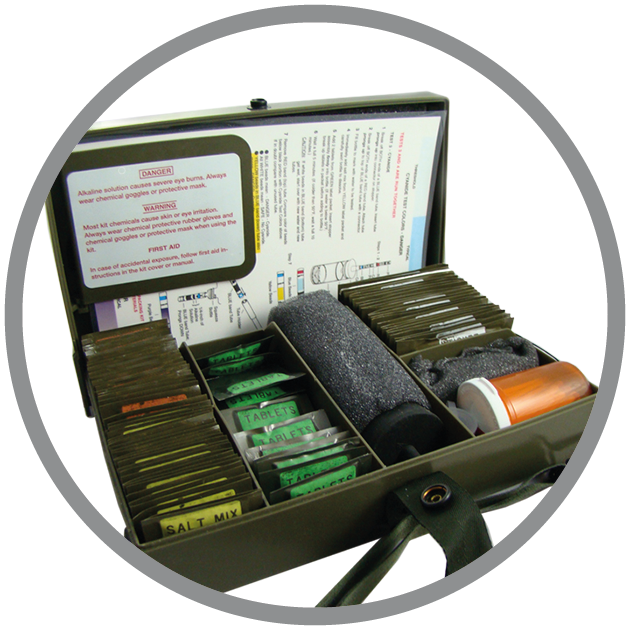 The M272 Chemical Agent Water Testing Kit determines whether water has been contaminated with nerve, blood or blister agents. The M272 is designed to test for Lewisite, nerve agents (V- and G- types), cyanide and mustard (H-) chemical agents which may be present in water. Operation of the kit requires training. This product is considered toxic and must be shipped via LTL freight carrier with HAZMAT restrictions in place. To test for nerve agents, first wet the provided test tickets with the suspected nerve agent and allow it to soak. Then press it against the reagent test patch. A blue color on the patch indicates the absence of a nerve agent. To test for blister and blood agents, treat the water sample with the reagent fluids. A color change indicates the type and degree of contamination. Samples suspected of (H) agent need to be heated before the reaction. In 2012, the State of California’s FIRESCOPE Standardized Equipment List, listed the M256A1 as a required item for emergency and Hazmat first responders.